The largest and most sophisticated Sport Yacht in the Riviera fleet will make her world premiere at the Sydney International Boat Show held from July 31 to August 4. This latest model from Australia’s favourite and most awarded luxury boat builder is a combination of Riviera’s 34 years experience and global owner feedback which has results in the birth of the new 6000 Sport Yacht. 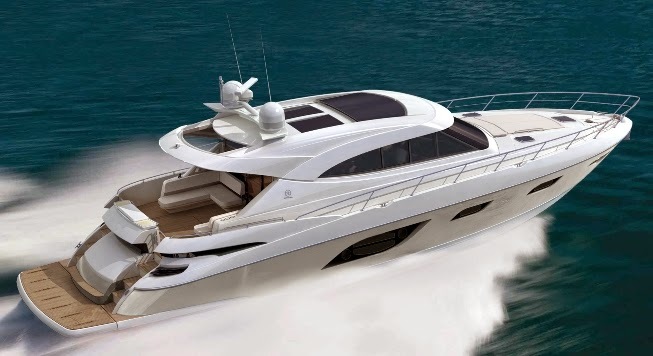 This new 6000 Sport Yacht was built for entertaining with an aft galley awning window that opens to the generous cockpit and provides plenty of seating both indoors and outdoors for on-board entertaining. At the rear of the cockpit and to center is an external wet bar with sink, ice maker, drawer fridge and twin barbecues. The cockpit also features a large fiberglass sunroof that extends over the seating area to provide protection but can also be opened to bring sunlight into the entertaining area. The aft galley is located in the entertaining hub of the vessel with central access to the cockpit and saloon. The well-planned saloon is perfect for indoor entertaining or relaxing with a U-Shaped lounge around a dinette table that seats six adults and a large two-metre long three-seater lounge opposite. The three-seater lounge is large enough to enjoy a lazy afternoon nap and versatile enough to provide an additional dining area by simply moving the middle seat base out as an ottoman and lifting up the table located between the two remaining seats. Forward of the saloon is the impressive helm station which has been cleverly sunken into the dash to improve visibility and ergonomics. The helm features enough space for two nineteen inch display screens and twin navigator chairs. The saloon also features a large glass Webasto marine sunroof to bring light and fresh air into the saloon area at anchor and underway. Below decks is a spacious and versatile accommodation plan featuring four staterooms and three bathrooms. The full-beam master stateroom is a key feature of the new 6000 with a king central island bed, sliding door on the starboard side giving access to an extremely generous walk-in robe, and there is also a roomy en-suite to port featuring sliding door entry and large port hole to bring in natural light. Forward of the island bed is the dresser with wall-mounted television and to starboard is a large lounge forming a parent’s retreat. A spacious utility room is located behind the master stateroom and can be accessed via the master wardrobe, cockpit or engine room. Standard power in the 6000 Sport Yacht is the new-generation and fuel-efficient twin Volvo 725hp with IPS pod drives featuring forward-facing, counter-rotating propellers. IPS offers an impressive power-to-weight ratio and torque, higher top-end speed and, in the case of Riviera’s 6000SY, delivers a top speed of over 30 knots under full load conditions.